Last week, I introduced y’all to our next restoration project – the Graves House in The Cajun Village. Originally built in 1910, it was moved up Hwy. 22 from Darrow, LA a few years ago. Progress is slow and steady – we are still working on replacing the original rotten floors before we move on to other areas of the house. And because we are still on the floors, I thought I’d expound a little on what we’re replacing them with. Al Robert and his family not only save, move, preserve, and restore historic vernacular Louisiana structures – they also deconstruct and salvage old buildings for their valuable building materials. Everything from old bricks used in the supporting piers, to old cypress siding to old floorboards; if it can be saved, it WILL be saved. Which brings us to the floors in the Graves House. The original floors are pretty beat up. 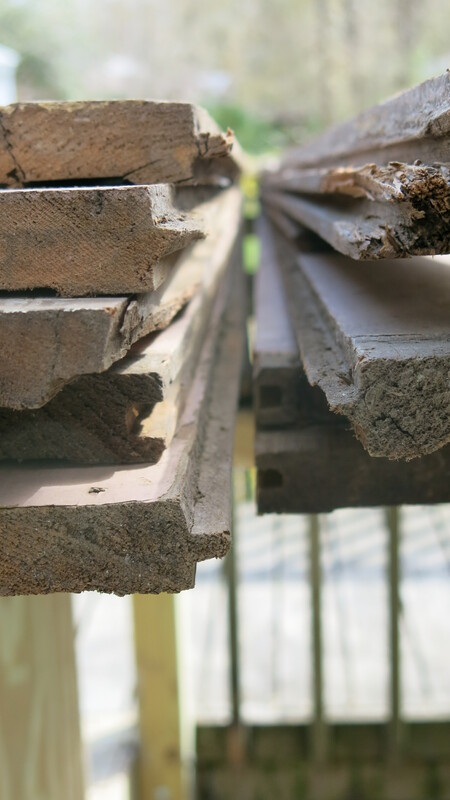 However, we have plenty of old tongue and groove floorboards to replace them with. For those of you who aren’t familiar with tongue and groove, it is a method of fitting similar objects together, edge to edge, used mainly with wood, in flooring, parquetry, panelling, and similar constructions. Tongue and groove joints allow two flat pieces to be joined strongly together to make a single flat surface. Each piece has a slot (the groove) cut all along one edge, and a thin, deep ridge (the tongue) on the opposite edge. The tongue projects a little less than the depth of the groove. Two or more pieces thus fit together closely. The joint is not normally glued, as shrinkage would then pull the tongue off. For many uses, tongue and groove boards have been rendered obsolete by the introduction of plywood and later composite wood boards, but the method is still used in higher-quality flooring, and especially in the restoration of older homes. More updates on the Graves House restoration project to come. We can’t wait till all the new boards are in and refinished!